For most of our shows we offer parking at the time of your ticket purchase. The Lot is located at East Corry and Short Vine at the VP3 building (behind Martino’s) and is managed by Star Parking. This will be garaged parking (barring clearance issues which would require you to be parked on the surface lot) and is the only Bogart’s PREPAID lot. Can I purchase tickets at Bogart's? If show is on a weekday Box Office will remain open until headliner hits the stage. If show is on a weekend. Box Office will open 2 hours prior to scheduled door time. Tickets are also available via LiveNation.com, by calling 800-745-3000 or at Ticketmaster outlets. We are not responsible, cannot authenticate, cannot trace, and cannot replace lost or stolen tickets that were obtained outside of these points of purchase. Does Bogart's have an ATM? Yes. Additionally, all of our bars accept credit cards. Due to Fire Marshall regulations anyone who enters the facility must have a ticket. No, per the Ohio State law we do not allow smoking inside of Bogart's. However, we do have an outdoor patio that people can access during the show. Does Bogart's have Food and Beverages available for purchase? Yes. Bogart's has several bars located throughout the venue. In addition to our tasty alcoholic and non-alcoholic beverages we also serve chips and candy. Does Bogart's have an ADA area? Yes on our Mezzanine level we do offer seating to anyone with an accessible need and the area also has an ADA restroom. What is the Fast Lane program? The Fast Lane allows first entry after door time for concert-goers and may be purchased at the time of ticket purchase. There are a limited number of Fast Lane tickets available for each show. Fast Lane program is not available for all shows. If it is available you will be prompted upon checkout if you'd like to purchase or not. There are several ways! You can check out our website www.bogarts.com, Like us on Facebook, follow us on Twitter or Instagram, or you can sign up for our newsletter which offers special deals and promotions. I purchased a ticket for a Bogart's show and it is supposed to be a Standing Room Only General Admission ticket but it has a seat number on the ticket. What does that mean? Inventory and sales are tracked by a seat number printed on the ticket. Unless otherwise noted all shows are general admission standing room only. Bogart’s is a general admissions standing room venue unless otherwise noted for a specific show. We do offer a limited number of reserved VIP Premium Seats & Suites on the mezzanine & balcony levels. For more information about VIP seating or upgrades, contact Mindy Goff at mindygoff@livenation.com or call 502-883-5804. For ADA seating, contact the box office at 513-872-8800. Does Bogart’s have an ADA area? Yes – Bogart’s ADA area is located on our mezzanine level. The area is first-come, first-served until full. Guest with an accessible need are able to bring up to three companions into the area, but due to the nature of the area, all guests must remain seated while in the accessible area. Are cameras allowed at Bogart's? It depends on each individual artist or performer's policies. Usually, small point-and-shoot cameras and cell-phone cameras are allowed. Cameras with lenses on them are considered to be professional-length are not allowed to be brought into the venue, unless artist has given prior approval to individual. Security will ask guests to leave such cameras in their cars. Audio or video recording is also almost never allowed at concerts unless otherwise noted. Are backpacks or large bags allowed into the venue? Large bags and backpacks are not permitted inside Bogart's. A small purse is permitted. To ensure the safety of all our guests, all bags are subject to search upon entering. What Items are not allowed inside the venue? The following items are prohibited for all shows: weapons (including mace and pepper spray), alcohol, drugs, lawn chairs, laser pointers, skates, wallet chains, spiked jewelry/belts, banners, backpacks, flyers, beach balls, aerosol cans, glass bottles, Frisbees, fireworks, sparklers, video equipment. Professional cameras and audio recording equipment are prohibited at most shows, at the performer's discretion. Other items may be disallowed at the discretion of our Guest Services staff based on the safety of all of our customers. If in doubt, please leave it at home. If I leave the building during a show, can I return? No. Once inside the building there is no exit and re-entry however we do have an outdoor patio for smokers. I left my credit card/ID at the bar at a show, how can I retrieve it? Can I check my coat/bag at Bogart’s? Bogart's does have a seasonal coat/bag check located just inside the main entry doors. Fee is $4.00 per item. How can I get a job at Bogart's? For employment opportunities with Live Nation please visit www.livenationcareers.com. Do you have a street team or internship program? Yes, for more info on how to join the Bogart's family email AlisonHall@livenation.com or MaggieCurtis@livenation.com with a resume and description of what work you are looking for. Are there restaurants near Bogart's? Yes we have several restaurants in the area. Across from Bogart's is Martino's, Mio's Pizza and Dive Bar. Around the corner is Hang Over Easy, Ladder 19, La Rosa's Pizza and several other options within walking distance. What time do doors open? What time does the first band go on? What time does the headliner finish? The time listed at Bogarts.com is generally the time that doors open for an event. Music will usually start 30-60 minutes after doors open. If a show is all ages, it must finish prior to midnight to comply with Cincinnati curfew laws. If a show is not all ages, it could run as late as 2AM (the vast majority of shows are all ages). Yes, for more info on how to join the Bogart's family email MaggieCurtis@livenation.com with a resume and description of what work you are looking for. How can my band play at Bogart's? Often times, touring bands come with their own support. However from time to time national acts will request a local opener. To be considered for a spot, please email WestonHebert@livenation.com with information about your band and preferably an EPK or a link to a website/soundcloud for reference. How do I join the VIP Premium Seat Program at Bogart’s? Enjoy your next show from the best and only seats in the house, VIP Premium Seats! Available for every show, multiple shows, or single shows (subject to availability). For VIP package options and pricing, contact Mindy Goff at 502-883-5804 or mindygoff@livenation.com. Does Bogart’s work with outside promoters or rent out the building for special events? When will my favorite band play Bogart's? We at Bogart's love seeing great live music. We make every effort to bring in the best bands from throughout the world, but unfortunately cannot bring every artist we would like to see. 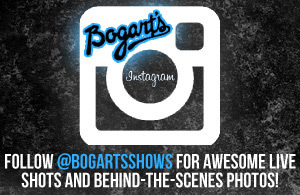 Keep checking our page for the latest updates and tell your favorite band you'd love to see them at Bogart's!